I thought we were hosting my sister and her new baby for Thanksgiving, but instead my son came home from school with… LICE! Our relatives checked into a hotel and we spent the holiday week giving thanks while picking, oiling and avoiding physical contact with loved ones. “Can I hug today?” my son asked each morning. I’ve been terrified of lice for decades. I first read about them in The Thornbirds when little Maggie’s head was shaved; and later trembled as a teacher when my students lined up in front of the school nurse. But even when lice infested children sat beside me or when I had my own children, and we were all exposed–visiting company, best friends, classroom trips–we remained lice-free. Apparently, lice is not so easy to catch. Honestly. Still, I enacted my own preventative regime (see below) which was part science/part lucky charm. As the years passed, however, I grew lax. My son grew his hair. His class grew infested. The moment my son arrived home from school, I made him stop on the porch so that I could examine him in the bright afternoon light. I searched and searched and searched until I spotted what might have been nits at the back of his head (those tiny, translucent, sesame-seed-sized eggs, attached to one side of hair shaft, like a cocoon, with an adhesive as strong as super-glue; See video below #1); but I couldn’t be sure. His hair was dirty-blonde, iridescent-ly so, which made identification almost impossible. Under bright lights, I searched the same section of hair and thought I saw something… move. After a mutual freak out, we returned downstairs to search the internet for what to do next, and we found some fantastic resources which quickly transformed us from victims to investigators/scientists. Dozens and dozens and dozens of live lice–virtually invisible moments before. How were the lice able to set up such an impressive, covert operation? Why hadn’t my husband been infested given that he lays down with my son each night? I decided not follow our school’s protocol for treatment given that they had failed to find or prevent lice from spreading (which probably had more to do with individual families and their ability to continue with the rigorous follow-up required. See video under #3). Instead I reached out to other families who had successfully treated (and prevented the return of lice), and I pieced together my own rigorous attack plan. This video, from the excellent resource, Head Lice to Dead Lice, helps orient the family to what is in store–with a much needed sense of humor. Part II of the video with the 5 Step Plan (Video under #3 below) is helpful for making sure you don’t re-infest your household after the initial removal. This video from, The Hair Fairy, lends the whole picking process a doable, matter-of-fact-ness, instead of our own earth-shattering doom. We relied on their thorough combing process (with a nit comb and hair conditioner) during our first treatment and thereafter. I will use this again if ever I suspect head lice in the family. It’s how we found ours and it’s how we continued to ensure that we didn’t re-infest. Here’s what we did from start to finish over a three-week period. 1) CHECKING: Checked head in natural light for nits, then under bright lights with a magnifying glass. 2) COMBING: Applied AMPLE conditioner (ours was tea tree) and used the combing process (See Video under #2) until we found: NOTHING. That first night this took many hours. We added conditioner as needed. Wiped bugs onto tissues and disposed of them. Washed the comb in hot, soapy water before successive comb-throughs and had our son repeat the process in the shower–using tea tree shampoo and conditioner (since we weren’t using the pesticide); and then did the combing process all over again; this time carefully searching each section of hair for any remaining nits (See Video #2.) Lastly we used a vinegar rinse (diluted) to help dislodge nits before combing again. 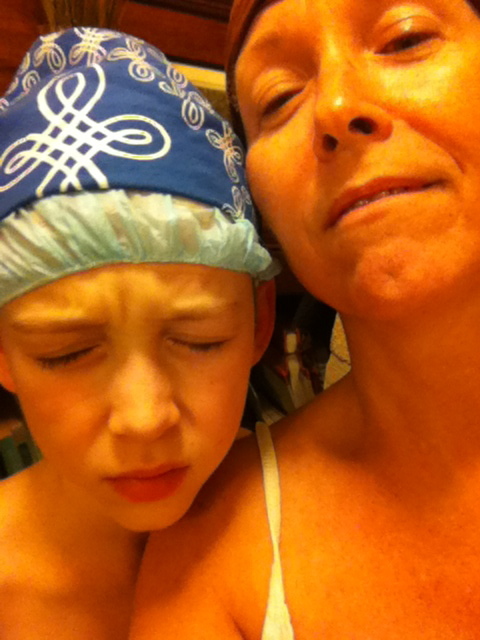 3) OIL: We doused our son’s hair in olive oil and applied diluted essential oils (eg. tea tree, lavender, rosemary, eucalyptus) before covering it with a shower cap and securing it with a t-shirt or bandana. a. We vacuumed the entire house with special attention to beds, couches, chairs etc. b. We changed all the bed sheets and washed dirty ones in hot water along with any clothing worn recently. d. We covered the couch with a new sheet each day. e. We repeated the vacuuming and washing/drying daily until there was no sign of lice/nits in the house. f. The infested persons avoided bodily contact with others and with couches etc; and also wore a bandana until there was no sign of lice/nits on their head for 24 hours +. 5.) FAMILY: The entire family oiled up that first night and then every 4 nights after for 3 weeks (as per the 5 Step Treatment Plan–video #3), including checking/combing in the morning before the oil was washed out. *Note: we also keep tea tree shampoo and conditioner (and other strong essential oils) on hand to use once a week or more regularly when lice is active in the school. See video under #3 above for more prevention tips. If you have your own successful tips for inspection, treatment, followup and prevention, please share them below. We have to rely on each other! !